Do you ever look at the ancient pyramids in Egypt and think, "Why isn't there a gigantic carnival ride on top of those?" Well, you wouldn't be alone. Because somebody asked that very question in 1931. 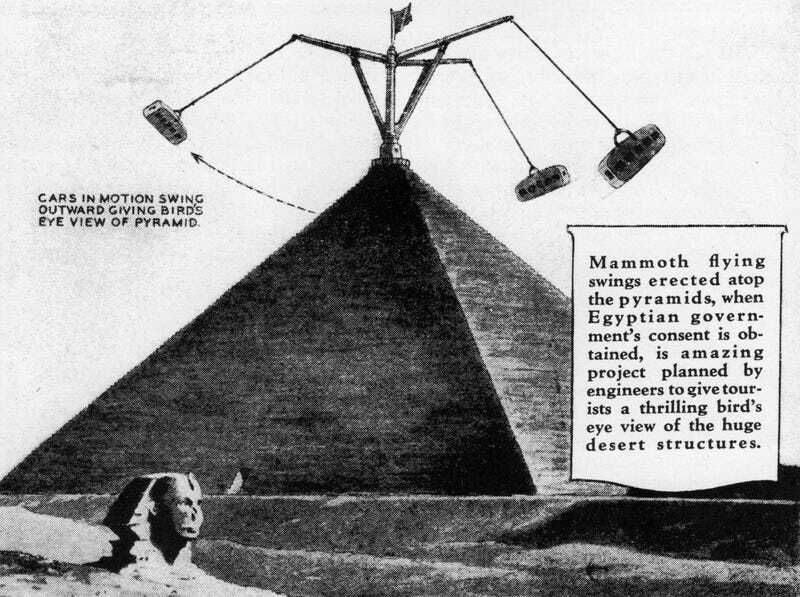 In a series of illustrations under the bold headline, "Mammoth Flying Swing to Give Bird's Eye Pyramid View," we see the pyramids as they could have been — the main attractions in Giza's own version of Disneyland. So why didn't this unbelievably irreverent idea come to pass? One suspects it might have had something to do with objections from the Egyptian government. The illustration mentions that when (not if) the government's consent is obtained, this amazing project will become a reality. But if you like a little hedonism to go along with your ancient history, don't worry — early 21st century Las Vegas has got you covered.